If you’ve been watching my video recipes for a while you have probably heard me mention my Uncle Bill more than once. Several of the Italian dishes on the site are variations (or exact copies) of his recipes I enjoyed growing up. So, before I left New York I wanted to try and capture Uncle Bill in action. This homemade fettuccine was always called “homemades” around the house, and so I thought I would post this recipe with it’s proper family name. I enjoyed this very basic, but delicious pasta recipe, which was made into either spaghetti or fettuccine every Christmas when Uncle Bill would cook an amazing feast for the family. There was always this homemade pasta (I mean “homemades”), as well as sauce, chicken and herbs, bracciole, salads, and countless other Italian delicacies (not to mention my Aunt Angela’s amazing pies). I don’t have much time this morning, but I will add more to this post later today, including the ingredient list. Like I already said, this is a simple recipe that just uses regular AP flour. You can, of course, use a mixture of semolina flour like many pasta recipes suggest. But, this recipe is very user friendly, and if you’ve never made your own pasta before, this would be a good place to start. By the way, those pasta machines are surprisingly affordable at your local mega-store or Bed Bath and Beyond-type home-goods places. Get one! The white motor you’ll see attached to the pasta roller in the clip is also sold at the same stores, and made to fit almost any model pasta machine. It does make things a little faster, but I kind of missed hand-cranking the handle on the machine. What did we do with this homemade fettuccine? You’ll have to check back later for the full story. Enjoy and stay tuned! 2 1/4 to 2 1/3 cup AP flour (you can always add flour, but not take it out, so even though we started with 2 1/3 cups, it may be better to start with 2 1/4 and then add a bit more latter if it seems too sticky. Where did you get your pasta maker? Where did you get your pasta maker, and why do you disable comments on youtube? 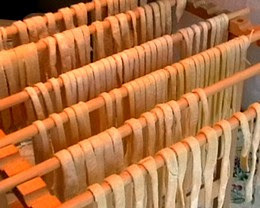 looks easy, but i'm scared to make fresh pasta. its so easy to buy dried from the store. true, it is easy to buy from a store (which i do most of the time myself), but making pasta at home is something you do because it's fun. Uncle Bill has had that pasta maker so long I doubt he remembers where he got it. I believe ours in SF came from Bed Bath Beyond. Google it, you see lots of suppliers! Any place that sells kitchen tools will have several models. Sears, Williams Sonoma (pricey there), maybe even target or walmart. I post on YT for two reasons, to get the code to embed into my blog posts, and to drive traffic to the site (the MAIN reason). If I interact with viewers on YT and answer questions there, there is less chance they then come and visit the site... which is the whole point. If I dont get a certain amount of traffic to the blog I won't be able to continue doing free recipe clips. So, not only will there be no comments on YT, there will be no videos! If someone has a comment or question it is quite easy to post it on my site. I dont have time to interact on both sites. Also, I can more easily monitor the comments on the website and avoid the spam I was starting to get more and more of on YT. I am one of the top subscribed food "Guru" channels on YT which makes my posts a target for spammers. Such a talented family! Great video. Great video, especially for the hand cutting tip. It's so simple, but I never thought of folding the sheet up to make cutting into strips easier. I started out making pasta the manual way, but these days I tend to mix the dough using my food processor, with great results. If you put all the ingredients in minus maybe 1/4 of the flour and mix, it's wet enough not to turn into crumbs, but dry enough to get pulled along and stretched by the blades. After about 1 minute of this it's remarkably well kneaded and you can add the remaining flour and combine. Yes, you can do it in the machine as you described, but I'll go to almost any length to avoid cleaning a food processer. Besides, most of the fun is kneading the dough! It just feels sooo good. That must have been a blast watching Uncle Bill make it from scratch. There is so much love put into things that are homemade. Chef John, I'm so glad to see the family stuff on here! Please send me an email at tonyquartaro@gmail.com if you find the time. I've been wanting to get in touch with you for a while. On the pasta makers, Sur La Table has good ones, and I purchased mine there at the Ferry Building. They also carry (in-store) replacement parts for pasta makers that need upgrades. Also, if you work in the industry, they offer discounts of 15% if you mention where you work. I want to try the home made fettuccine recipe but because I live in the UK i'm not sure how many grams of flour I would need! Could you help with the conversions please? In the Main Menu in the sidebar you will see a link for "Kitchen Calculators" You can convert any recipe there. He doesnt use weight for the flour,he uses cups so its about 1/2 liter. Check out the calculator for other conversions. Thanks. ah ok thanks. One more question! how long can you keep fresh pasta for? Thank you for the most straight-forward and helpful pasta-making video on the web. can you substitute part of the flour with seminola flour? If so how much? Just a quick question, not about the food, but about your site. Why do you not use a Wordpress blog? That way you could have your blog be on your own domain (Foodwishes.com). The only thing that might seem hard, whether you're tech savvy or not, would be creating your own theme. I already have the domaine foodwishes.com, and plan to eventually have the blog live there. I've been so focused on keeping the blog going as a full time job, that I've haven't do it yet. Do you know how I would get all my content over to another platform, and what about my pagerank, etc. I guess I would redirect from this site? As far as transferring content, it would be a pain, just copy & pasting the code/content. As far as pagerank, I'm not sure there is too much you can do. You could edit your video's (on youtube, etc.) and change their info to have a link to your page, which it looks like you've already done on some videos. You could read up on some SEO stuff for a start. It really shouldn't be a problem, and even less of one probably if you're on your own domain. Just by Googling "food wishes" I came across this, so I doubt your pagerank is that high anyways. By the way, that's a Wordpress site, except not one of the versions you install on your own site. Chef John; Who is the handsome fella you have for your right hand man??? John it is so nice to make real homemade. And I am glad your family makes homemade. I like homemade too,but I don't know how to make homemade tomato sauce.Can you help? I am using this recipe to make lasagna noodles. Should I precook (boil) the noodles before making my lasagna, or just let them dry out and let them bake in the oven? Beautiful! I've never made my own, but now I'm looking forward to making my first batch! Thanks for the wonderful site, I've tried to spread the word to some foodie friends! How many people will this comfortably feed? And when we let the dough rest should we put it in the fridge? And should the water be ice water? And you said minimum 20 minutes to let it rest, is 30 too long? What happens to the pasta if you let it rest too long? I am full of questions, obviously. I recently got an Atlas pasta machine and can't wait to try it out! about 4 to 6 depends. It can rest for as long as you want. no isnt ice water. I tried this today and while it is decent, I struggled quite a bit with the stretching part. As I put it through the pasta machine (varying amounts of dough, from large to small) the dough seemed to get separated and almost grainy. Could this be cause by dryness? Any solutions/ideas? I've been making homemade pasta for some years now and I enjoy it a lot. When making filled pasta (as opposed to plain fettuccine or spaghetti) I notice the texture ends up being a bit too rustic. Perhaps it's a bit too thick, although I finish flattening the dough with a rolling pin (it gets even thiner than the level 1 on the machine). Question is, do you change the quantities of any ingredients when you make dough for filled pasta compared to plain pasta? Have you noticed how the dough reacts when using more or less water or oil? My impression is that your recipe calls for more water than I typically use and I should try that to see if the texture would become more smooth. Hate to disappoint u but I can't remember the last time I made fresh pasta for filling. I ususally cheat and use wonton skins for tortellini and ravioli. Otherwise I beleiv the same dough is fine just rolled much thinner. Now i understand how the Karate Kid felt like when he learned that Bruce Lee used pepper spray to defend himself. I will give the wonton skins a try. By the way, at the Slanted Door they make some sort of imperial rolls (i believe with wonton skins), filled with pork belly and vegetables and a spicy/minty peanut sauce. They taste great and it would be nice to see you trying that idea at Food Wishes one day. I found a pasta maker that looks very similar to what is used in this video. From the looks on the pasta maker in the video, he has replaced a hand crank with an electric motor. The link at the end of this post shows a very similar looking model with an optional electric motor accessory like the one used in the video. It isn't the same pasta maker though, but could easily be from the same company just an older version in the video. I plan on getting a pasta maker. You can find this on eBay too for a bit cheaper. Can I freeze the pasta after it's cut and dry or do I have to cook it first? You can freeze it uncooked. Googled 'how to make homemade pasta' and found your video and site. Very nice. Thanks. Hi Chef John! I've made this recipe quite a few times with much praise from my family, but most of the time I'm just too impatient to let the pasta dry for the whole 3 hours. I'll let it sit for an hour or so before give in and cook them. Is there any benefit to let it sit for longer that I might be missing out on? I like the texture better if they dry more. Thank you Chef John and Uncle Bill I just made homemade fettucine pasta and it came out great. It was my first time and I followed everything that Uncle Bill did non the video and I also remembered what my mother used to do when she made homemade pasta. She was very good at making orecchiette and gnocchi. I will tackle that soon. I was always worried about making the dough and now my worries are over. Thanks again you made it look so easy. Love your Food Wishes Site...Sorry to hear about Uncle Bill, wish I could have seen more of the Man. Thank you for sharing this lovely video with your Uncle Bill, and again I'm very sorry for his loss. I decided to make "homemades" this weekend for the first time ever. I had intended to make and eat them on the same day, but found out Sunday afternoon that my in-laws were coming on Monday, so decided to try making them a day in advance and cooking them the next. I'm really glad I did! I followed your Uncle's recipe and technique as closely as I could, and the pasta turned out fantastic! I don't have a pasta roller so I cut the dough into quarters and rolled each piece with a rolling pin, and was pleasantly surprised by how strong the dough was. I then loosely rolled the dough and cut by hand as shown in the video. I had liberally dusted the dough with flour while rolling and after cutting, and put the pasta in the fridge overnight, removing about an hour before use. My pasta cooked in about four minutes and I sauced it with a short rib ragu that I had also prepared yesterday. I hadn't had "homemades" in probably 20 years or more, and it was a real treat! I can't wait to make them again! Thanks again for the great recipe and tutorial! Hello Chef John! I love your videos, and I love this recipe. What is the cooking time for this pasta? If I was to use whole wheat flour, would I use the same amount as white? What's the best way to store it ? Make it, dry it for three hours, then ziplock bag and freeze it ? Hi chef John, should u religiously let the pasta go hard before u cook it? Is it better that way? Thanks for the great recipe. I live in the high desert and I actually had to make double the recipe. I noticed the first try dried out fast. I was still able to work with it perfectly. The second batch, I didn't add the 1/4 cup. It might just be the dry climate up here but it came out perfectly. For anyone wondering, that dough works well for stuffed pasta. I'm currently using this dough for tortellini. P.S. thanks so much for the granita recipe.